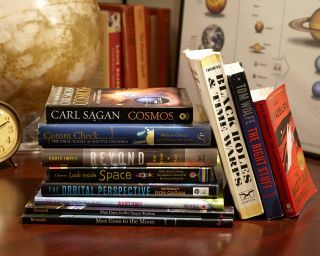 There are plenty of great books out there about space — so many, in fact, that it can feel a little overwhelming to figure out where to start, whether searching for a perfect gift or your next engrossing read. So the editors and writers at Space.com have put together a list of their favorite books about the universe. These are the books that we love — the ones that informed us, entertained us and inspired us. We hope they'll do the same for you! We hope there's something on our lists for every reader of every age. We're also eager to hear about your favorite space books, so please leave your suggestions in the comments, and let us know why you love them. You can see our ongoing Space Books coverage here. "Lasers, Death Rays, and the Long, Strange Quest for the Ultimate Weapon," by Jeff Hecht. In the newly released book “Lasers, Death Rays, and the Long, Strange Quest for the Ultimate Weapon,” (Prometheus Books, 2019), veteran science writer Jeff Hecht details the strange and incredible history of real-life laser weapons. Lasers have captured the public’s excitement for decades, appearing as phasers, ray guns, and more in countless works of science fiction. Read an interview with Hecht about the book here.